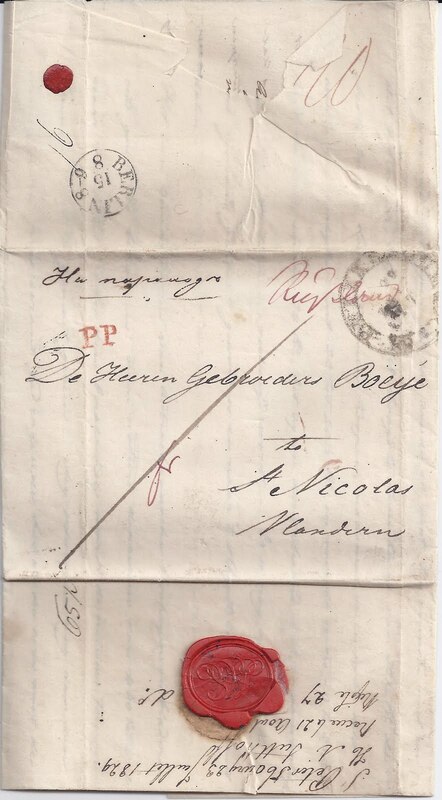 This is a fairly ordinary Russian pre-philatelic entire letter, written (in Dutch or Flemish) in St Petersburg on 23 July 1829. It arrived in St Nicolas, Vlandern (Flanders) on 21 August, having passed through Berlin on the 15th August - see the transit cancellation. What is interesting is the annotation top left of the front, "Na parokhod" - By Steamship. I wonder if this is an early date for such an annotation, which I have not noticed on other pre-philatelic letters of this period. Does anyone know? This is indeed an interesting cover. I have seen quite a few covers from St Petersburg adressed to different parts of Western Europe from the 1820s and 1830s. 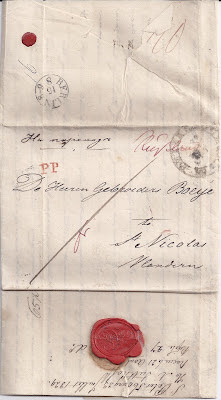 Usually, the Ship Mail letters are following the Luebeck-Hamburg line and, later in the 1840s, the Stettin line. The inscriptions can be in the vain of "Via Hamburg" or "via Steamer ... " (in English, for letters to London for example). It is also sometimes possible to see the name of the forwarding agent written on the folded part. From what I see from the scan, there is no mention of a forwarded agent, or anything that could confirm that this letter REALLY travelled via ship mail. What makes me raise an eyebrow is the Berlin transit mark. There was no logic for a cover supposed to arrive at Luebeck to be re-directed in Berlin (opposite way) ... unless it travelled on dry ground - making a halt in Berlin on its final way. Maybe the red "PP" could explain something? I would be interested to know if a more knwoledgeable reader has the answer. Thank you, Mr Pateman, for posting it!